Graci is known, as a fashion label, for its beauty and a big love with flowers. 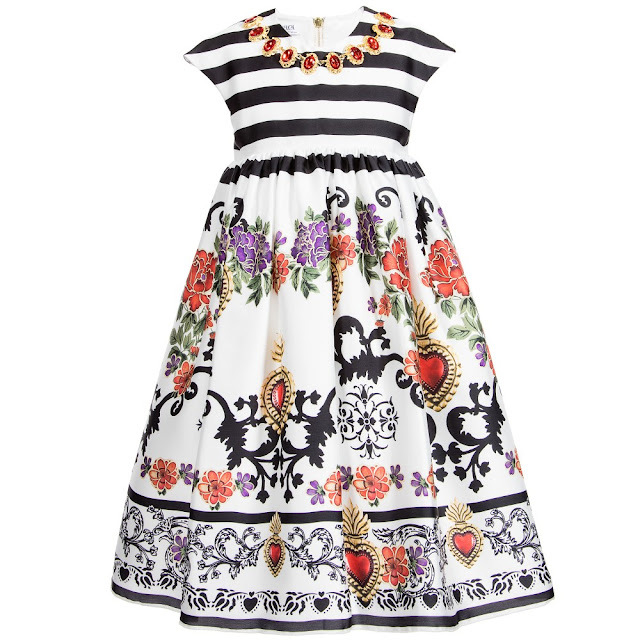 Complement a spring garden setting with a floral-embellished dress. From embroidered blossoms to 3-D buds, these nature-inspired elements can provide colour to whimsy sheaths and ball gowns alike. Wear an airy A-line dress with floral add-ons on the bodice and waistline, or tone it down with a lightly floral-embellished sweep train for a subtle (yet distinct) spring style. 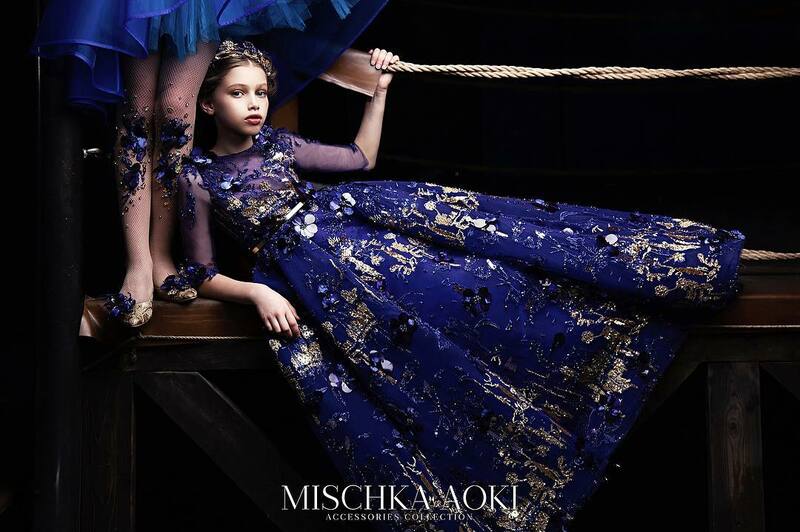 Beautiful, almost alluring, girls couture dresses, let's see'em! 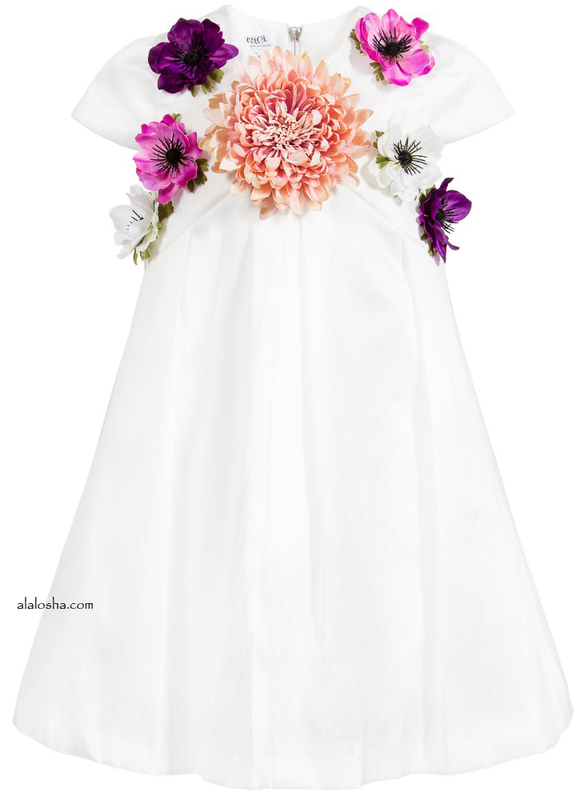 Girls white, sleeveless dress by Graci, made with a synthetic silk feel. The fitted black and white striped bodice has a metallic gold and red gem necklace attached. 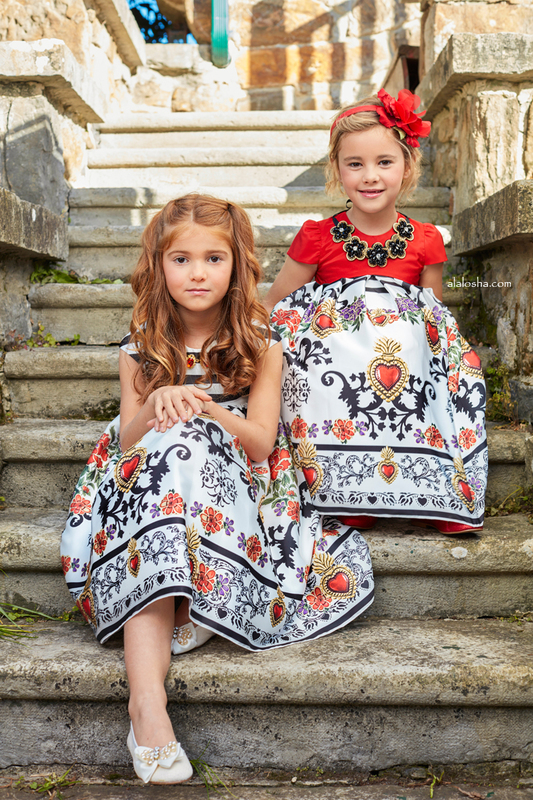 The skirt has a black print with pretty red flowers and printed gems. It has gathered from the waist, with an under a layer of satin and is lined with smooth cotton, with a tulle frill which adds volume to the flared skirt. It fastens with a metallic gold zip at the back. 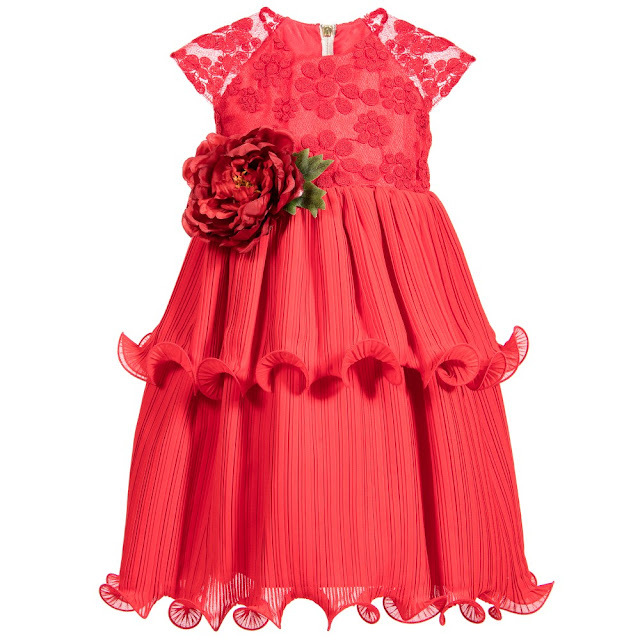 Girls pretty red dress, with capped sleeves by Graci. 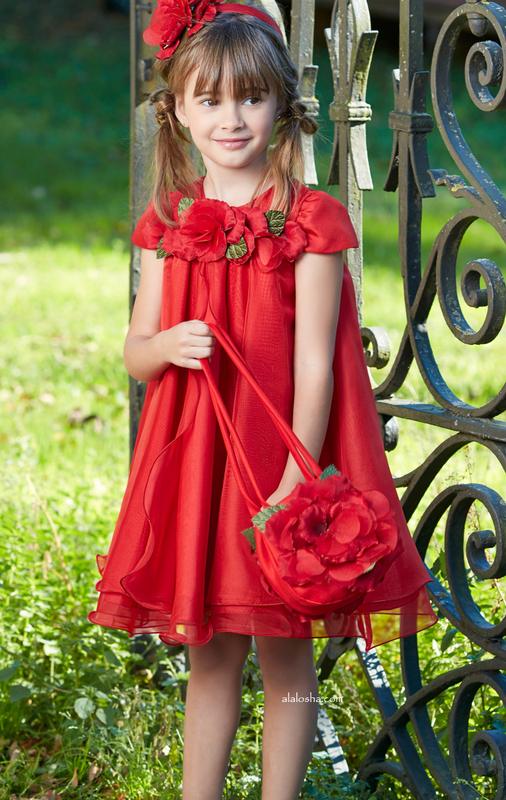 The fitted top is made with floral embroidered tulle over a silky lining, with a detachable red flower brooch. From the high waist, the skirt is made with two tiers of finely pleated organza, with fluted ruffled trims. 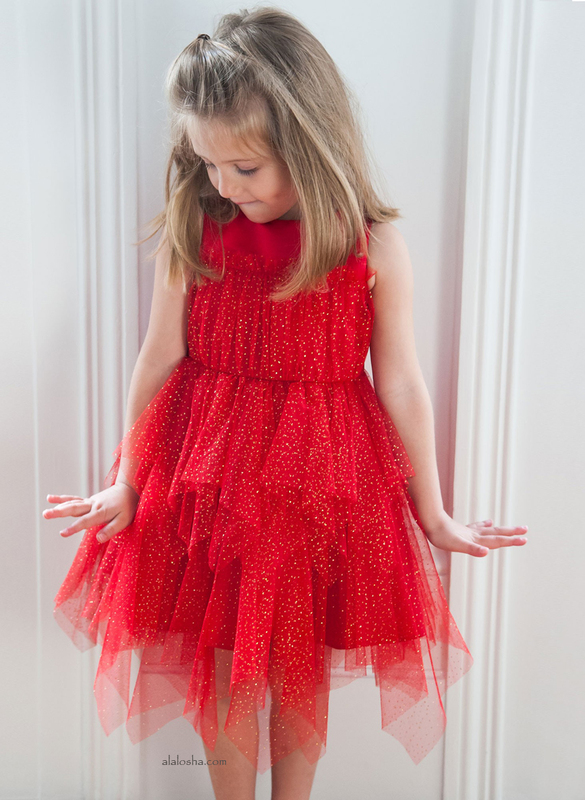 It has gathered from the waist and is lined in smooth cotton, with a tulle frill which adds volume to the flared skirt. It fastens with a metallic gold zip at the back. 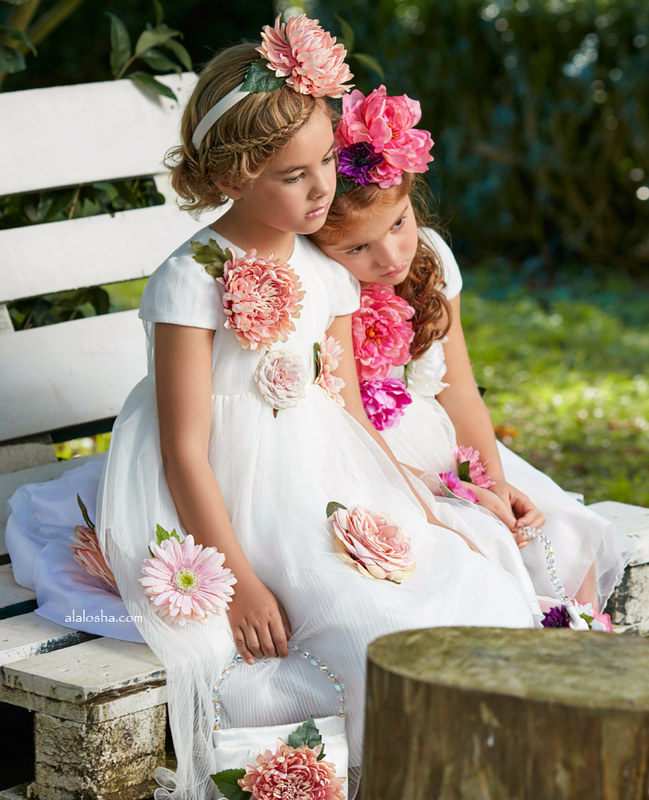 Graci, girls short sleeved, ivory and white tulle dress. Made with a layer of pleated tulle on the fitted bodice and asymmetrical layer across the front, which has a fluted ruffle trim. The skirt is made from white tulle over satin and is lined with smooth cotton, with a tulle frill to add volume to the flared look. It has a shaped hem to be longer at the back and the front is decorated with pretty colourful flower appliqué. It fastens with a metallic silver zip at the back. Girls pretty pale ivory, short sleeved dress by Graci. Made from matt, cotton taffeta, it has a shaped high waist with pleats, giving an A-line shape. The smooth cotton lining has a tulle frill which adds volume and it fastens with a metallic silver zip at the back. The top is decorated with colourful flower appliqué.